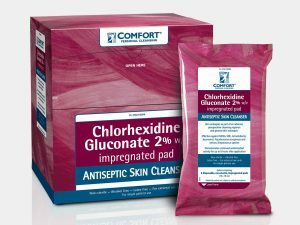 Address multi-drug resistant organisms on your patient’s skin prior to surgery with SAGE 2%CHG pre-operative wash clothes which are skin-friendly, easy to use and provide a uniform dose of CHG. Fast-acting, broad-spectrum, and alcohol-free, our 2% CHG stays on the skin to help prevent infection. 2% CHG Rinse-free formula provides antimicrobial activity up to 6 hours after application. Cleans and moisturises the skin. Provides a uniform dose (500mg of CHG in each cloth) of CHG to the skin, is fast-acting and effective against a broad spectrum of microorganisms and active in the presence of blood and other organic matter. n Easy to use for a patient with impaired mobility, it replaces bottled solutions, which can be rinsed off in the shower and the nonabrasive, textured cloth removes debris, allowing CHG to thoroughly cover prep area with no drips, runs, or pooling. The 4% Chlorhexidine antiseptic soapy gel contains pro-vitamin B5 for deep skin cleansing, care and hydration. It is the first product of its kind in a gel format which allows for a greater skin absorption of the chlorhexidine. It is a convenient option for a decolonising patient skin wash before surgery, or for those cleaning patients carrying multi-resistant bacteria. It is also recommended for the pre-surgical scrubbing of healthcare personnel’s hands and forearms. Its composition without anionic surfactants cares and moisturises skin. Furthermore, the higher adhesion of the product enhances the sustained effect of chlorhexidine on the patients’ skin. Antiseptic washing and decolonisation for patients’ skin prior to surgery. Pre-surgical antiseptic scrub for hands and forearms of healthcare personnel. Wet the skin ideally in the shower. 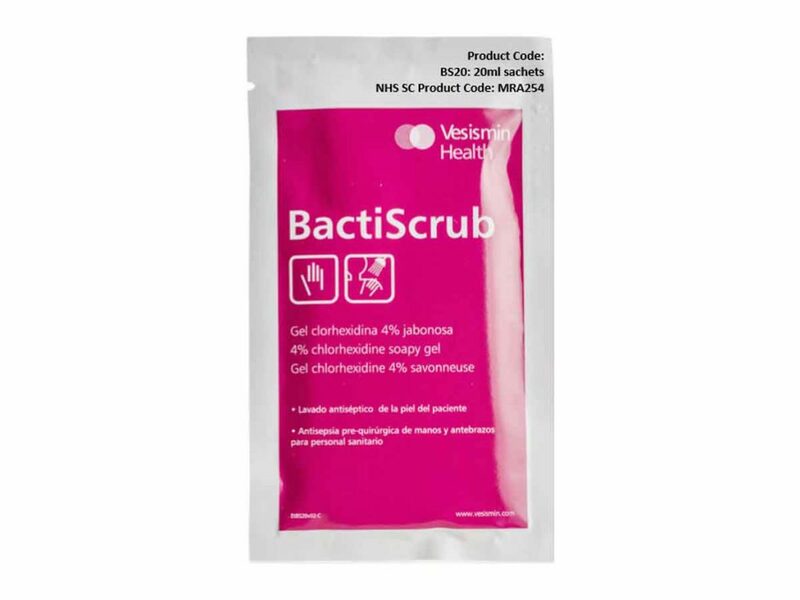 Apply BactiScrub without diluting, directly to the wet skin, washing all the body, avoiding contact with the eyes, ears and mouth. Leave the solution on the skin for about 3 minutes to assure antiseptic absorption. Rinse off and dry the skin.  Once the skin is washed, do not apply any other bathing products, lotions, moisturisers or makeup, since they can reduce the effectiveness of chlorhexidine. Chlorhexidine digluconate 4.0 g/100 ml. Non-ionic surfactants.  Emollients (Panthenol or Vitamin B5), excipients and water. Bactericidal (EN1499) Hygienic hand wash (Escherichia coli). Bactericidal (EN 12276) Staphylococcus aureus, Enterococcus hirae, Pseudomonas aeruginosa, Escherichia coli. Yeasticidal (EN 1650) Candida albicans. Pre-surgical antisepsis (EN 12791, sustained effect 3h).